Using an open center valve in a closed center system (should use closed center valve). Using a closed center valve in an open center system (should use open center valve). Using outlet port flow to second valve (should use power beyond option - Series B). Using Series C valve in load lifting application (should use Series B with load checks). Using valve without motoring spool in hyd. motor drives (can damage motor and valve). Using 3-way valve with double acting cylinder or 4-way valve with single acting cylinder. The Series B valve, if ordered with the power beyond option, can be converted from open center to closed center by installing a closed center plug in the power beyond port and setting the relief valve at least 500 psi higher than system pressure (or replacing the relief valve with "D" plug 1 R0035). 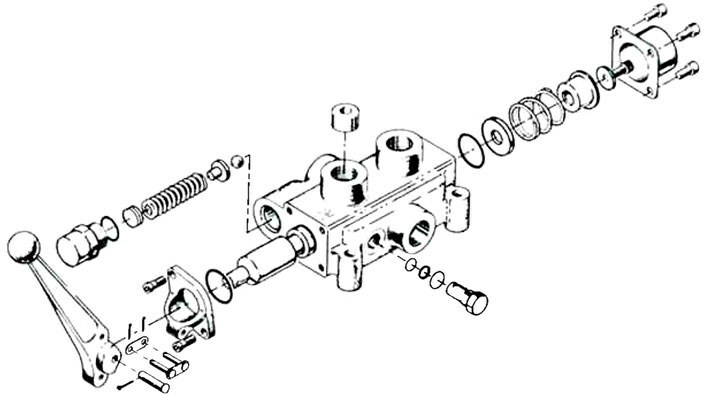 The CV version valve includes a conversion plug for changing from 4-way to 3-way operation. (Refer to Cross literature "Directional Control Valve Accessories - Conversion Plug" for detailed information). Series B and C valves are available with adjustable relief valves - the "F" designation from 500 to 1500 psi (factory preset at 1000 psi) "G" designation from 1500 to 2500 psi (factory preset at 2000 psi). Pressure settings are made at 10 gpm and hence, pressures will be slightly higher at higher flow rates and slightly lower at lower flow rates. To reset, remove acorn nut, loosen lock nut, turn screw clockwise to increase pressure or counter-clockwise to reduce pressure. Series B and C valves are available with pressure released detents which are factory preset at 1000 psi and can be adjusted in the same manner as the system relief valves . (Should be at least 200 psi less than relief valve setting). Never Attempt To Adjust Pressure Without The Use Of A Reliable Gage In The System. Symmetrical mounting holes permit the valve handles to be mounted in any of 4 positions, at 90° intervals. Series B and C valves are limited to 3 positions and multiple spool valves to the up or down position. If handle position is changed from the factory assembled position, the capscrews should be “LOCTITED” when reassembled. CAUTION: Handle extensions should not be used as the resulting increased force could damage valves. When mounting, be sure there is adequate space to permit full handle movement. Valves may be mounted in any position. Series B and C valves have 3 mounting feet; SD and VS have 2. BC, C, SD and VS4 use 3/8" bolts (19-20 ft. Ibs. torque). Bolts for the VS are 5/16" (11-12 ft.lbs. torque). Mounting surfaces must be flat and care should be used when tightening mounting bolts. Over-tightening bolts on uneven surfaces can distort the valve body and cause spool binding and casting breakage. Prior to installation, check valve for possible damage in shipping or handling. Install valve and tighten fittings. OVER-TIGHTENED PIPE FITTINGS CAN DAMAGE VALVE. Fill reservoir as necessary, using the correct, clean oil. Start system and check for leaks. CAUTION: DO NOT USE HANDS. Bleed air from system, as necessary. Gradually increase load, checking for leaks, abnormal noises, binding, etc. Clean and replace filters on a regular basis, as needed. Check for presence of water in oil (cloudy appearance), air in oil (foaming oil), or burnt oil (rancid odor). Correct problem as necessary. Check reservoir level regularly. Fill as needed. There are only 3 potential spool valve problems: external leakage, excessive internal leakage, or spool bind. External leakage due to seal failure can be corrected by replacing seals. Leakage due to a cracked valve body requires complete valve replacement. Excessive internal leakage is usually caused by worn spools due to contaminates in the oil. Replace valve and system oil. Spool bind is caused by contamination, excessive heat, improper mounting or misalignment of valve linkage. Correct problem as needed. Refer to CROSS Trouble Shooting Guide for system overheating problems. Cross spool type directional control valves are not field repairable except for seal replacement and relief valve cartridges . Spool seals are easily replaced by removing the handle bracket, end cap and o-rings. Replace O-rings using standard seal kits, (refer to appropriate parts list). Reassemble valve and "LOCTITE" cap screws. Standard seal kits include o-rings for relief valve cartridges and conversion plugs (if appropriate). CS (solenoid) version valves do not have spool seals; however, the solenoid cartridge seals can be easily replaced if needed. Worn detents can be repaired by installing a replacement detent kit. Temporary repair is possible by removing the handle and rotating the spool 180°. Maximum spool leakage 16 cc/min. 16 cc/min. 32 cc/min. 16 cc/min. 16 cc/min.